(CNN) -- All six airmen aboard the B-52 bomber that crashed Monday off Guam's northwest coast were killed, Air Force officials confirmed Wednesday. 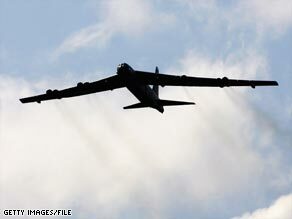 The B-52H Stratofortress, like this one, was in Guam as part of a four-month rotation. Aboard Raider 21 were Maj. Christopher M. Cooper, 33; Maj. Brent D. Williams, 37; Capt. Michael K. Dodson, 31; 1st Lt. Joshua D. Shepherd, 26; 1st Lt. Robert D Gerren, 32; and Col. George Martin. The plane crashed about 30 miles northwest of Guam, the Air Force said in a statement. Air Force crews switched from a rescue operation to a recovery operation over the 7,000-square-mile crash site, said Air Force spokeswoman Sgt. Ashleigh Bryant. The bomber was scheduled to fly over crowds celebrating Liberation Day, which commemorates the U.S. capture of Guam from Japan in 1944, said Capt. Joel Stark, spokesman for Andersen Air Force Base in Guam. The B-52H Stratofortress, based at Barksdale Air Force Base in Louisiana, was in Guam as part of a four-month rotation when it went down about 9:45 a.m. Monday (7:45 p.m. ET Sunday), Stark said. Martin was a physician and second in command of the medical unit at Andersen and not a member of the crew. There were no weapons or munitions aboard the aircraft, the Air Force said. In February, a B-2 stealth bomber crashed shortly after takeoff from Andersen Air Force Base. Two crew members ejected safely.